The Yard Hauler is a purpose-built tool for collecting, hauling, and dumping a variety of materials. It has the flexibility of a tarp and the convenience of a bag combined into one simple device. The built-in handles ensure there is always a hand-hold for hauling or dumping your yard materials. The Yard Hauler is ideal for hauling leaves, clippings, weeds, bark, mulch, branches and more. Made from durable woven tarp material with built-in handles for easy hauling. Easily handled by one or two people. Compact and lightweight, folds to 8x11 inches. Easily holds 30 gallons of material and is easy to empty. 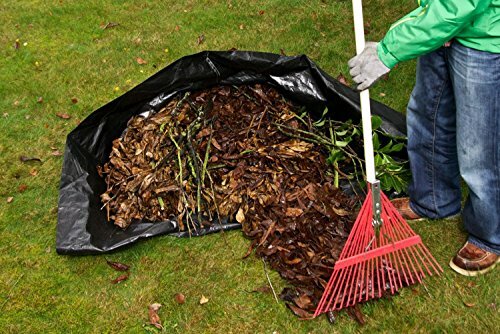 Hauls leaves, clippings, weeds, bark, mulch, branches and more. If you have any questions about this product by Brightwork Innovations, LLC, contact us by completing and submitting the form below. If you are looking for a specif part number, please include it with your message.